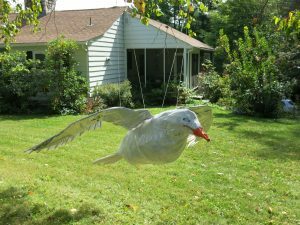 The Seagull is an art project which connects the viewer with the huge plastic garbage patches in the ocean. Originally conceived by Judy Eddy as a way to make a statement with the piles of plastic bags she had refused to throw out over the course of years, it was built by Anne, Judy and Karen out of metal clothes hangers, used fence wire, plastic dry cleaner bags, and inside- out chips bags, throw away chopsticks and recycled paper. At the festival, the seagull attracted the attention of many children, who loved to cause the wings to move, making the seagull fly, and dreamed of riding on its back. (A little toy dog did get to fly on the seagull’s back.) The seagull sometimes functions as our mascot. It accompanies us to festivals and gatherings, where it invites conversations about the effects of plastic waste on the environment.